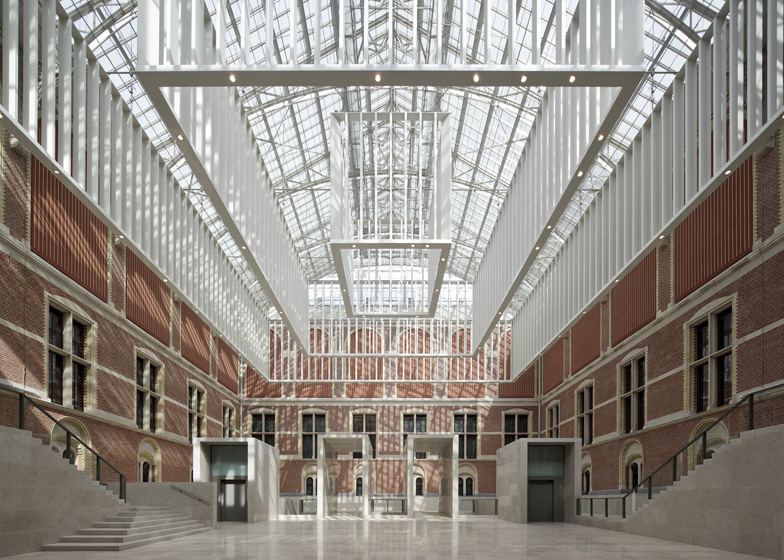 The Rijksmuseum in Amsterdam is set to reopen next week following a ten-year restoration and extension programme led by Spanish office Cruz y Ortiz Arquitectos (+ slideshow). Working alongside French architect Jean-Michel Wilmotte and restoration architect Van Hoogevest, Cruz y Ortiz Arquitectos has overhauled the interior of the historic arts and crafts museum, which was designed by architect Pierre Cuypers in the late nineteenth century. As well as restoring galleries to their original configuration, the architects have created a new entrance hall and added a pavilion to showcase Asian artworks. The entrance hall, named the Atrium, replaces a series of gallery extensions in the museum's two inner courtyards. A rib-vaulted passageway divided the space in two, so the architects have lowered the floor to create an underground zone linking the two sides from underneath. As the main route through the building, this passageway was then reconnected to the hall with a set of new staircases. The architects have installed a new glass roof to enclose the grand triple-height court, filled with natural light. Polished Portuguese stone covers the floor, while two rectangular chandelier-like structures are suspended overhead on each side. 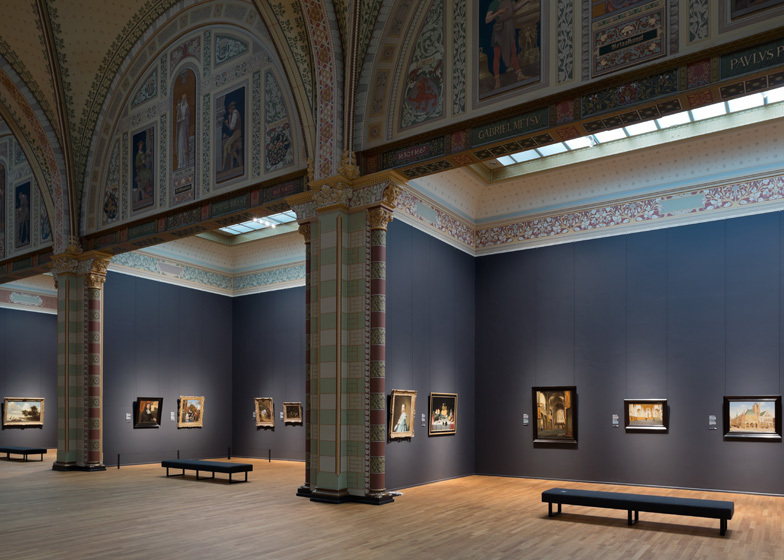 Elsewhere in the museum, lowered ceilings and half-storeys have been removed to rationalise the layout of the Rijksmuseum's 80 galleries, which have been completely reorganised. Only Rembrandt's seventeenth-century painting The Night Watch remains in its original position, in the dedicated Night Watch Gallery. 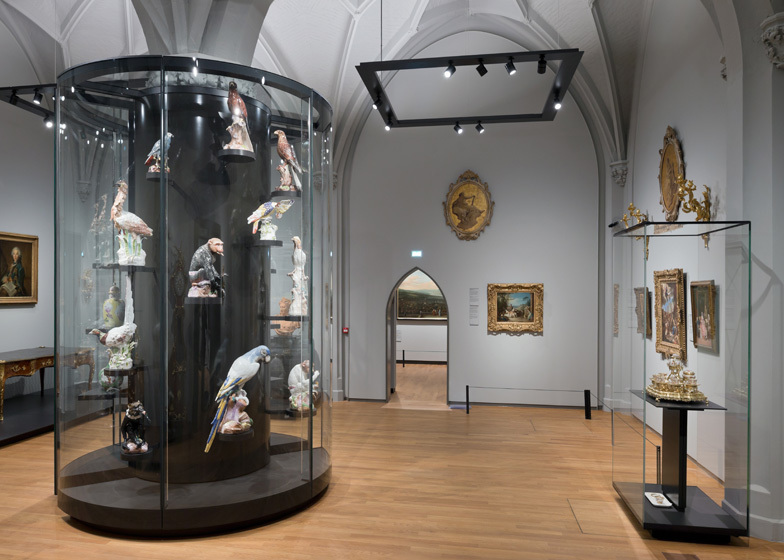 New display areas are designed by Jean-Michel Wilmotte to look invisible where possible and include cases made from anti-reflective glass and simple rectangular plinths. 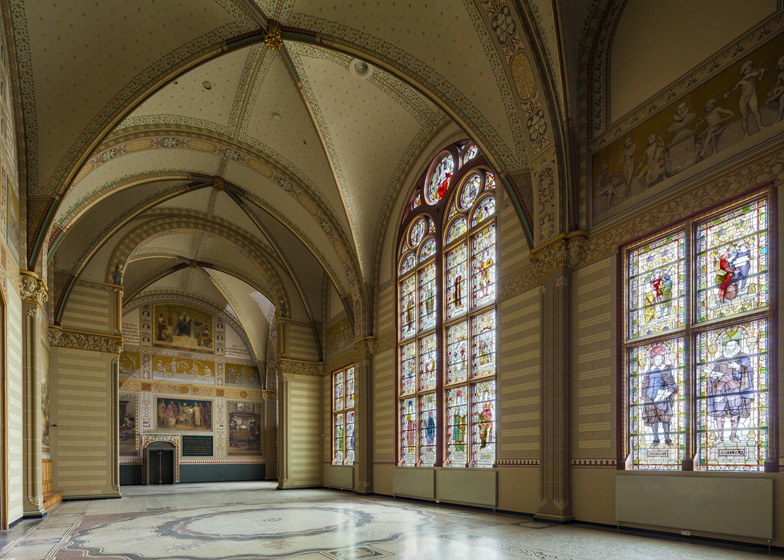 Walls are finished in five different shades of grey, in line with Cuypers' original palette. Under the supervision of Van Hoogevest, the terrazzo floor has been restored in the Great Hall, while additional ornaments have been revitalised in the Gallery of Honour and within the stairwells. The new Asian Pavilion is located to the south of the building and features walls of stone and glass. It is surrounded by water and sits within redesigned gardens by Dutch landscape architects Copijn Landschapsarchitecten. A number of historic museums have been given a facelift in recent years. 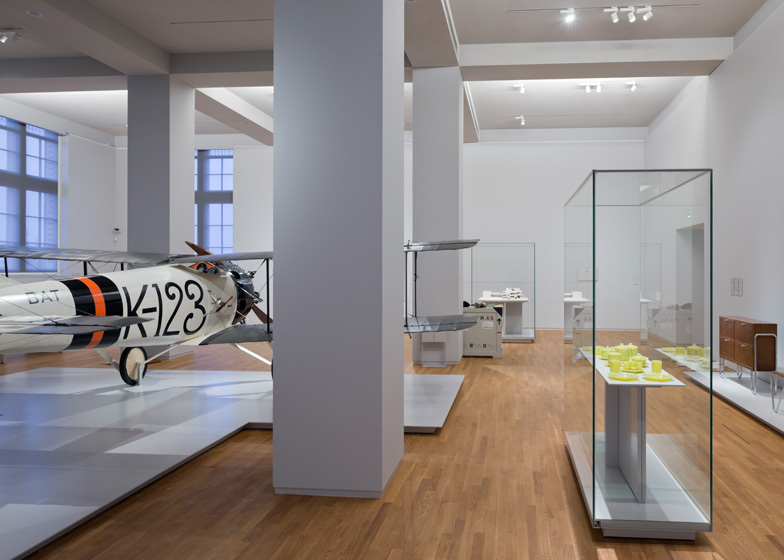 Also in Amsterdam, Benthem Crouwel Architects recently added a sink-like extension to the Stedelijk Museum, while David Chipperfield won the Mies van der Rohe Award for his 2009 renovation of the Neues Museum in Berlin. See more museums on Dezeen. 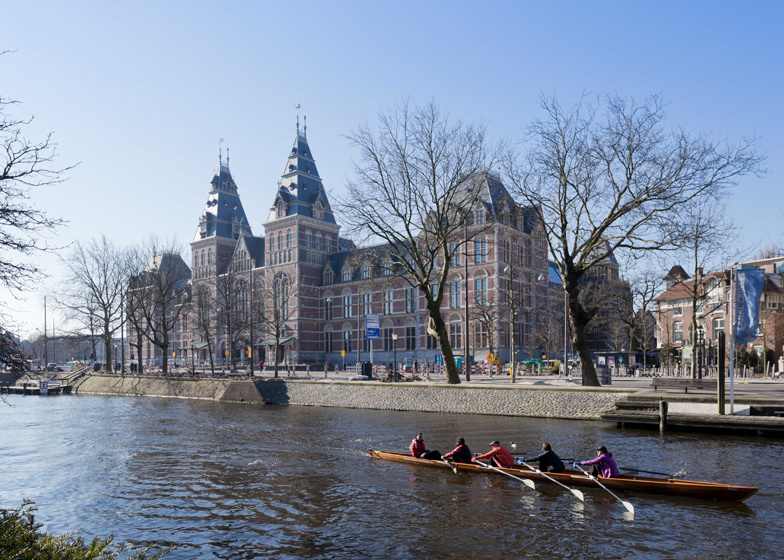 The Rijksmuseum will open on 13 April 2013, following a ten-year transformation. Never before has a national museum undergone such a complete transformation of both its building and the presentation of its collection. Spanish architecture firm Cruz y Ortiz Arquitectos has spectacularly transformed the 19th-century building into a museum for the 21st century, with a bright and spacious entrance, a new Asian Pavilion and beautifully restored galleries. 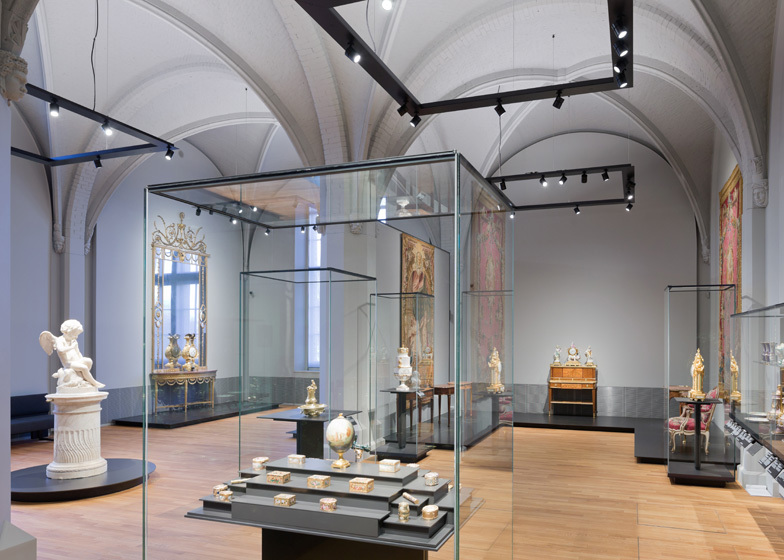 Under the guidance of restoration architect Van Hoogevest, the lavish decoration scheme of Pierre Cuypers, the original architect of the museum, has been fully reconstructed in a number of the museum's key spaces. Parisian architect Jean-Michel Wilmotte designed the new interior of the galleries, fusing 19th-century grandeur with modern design. 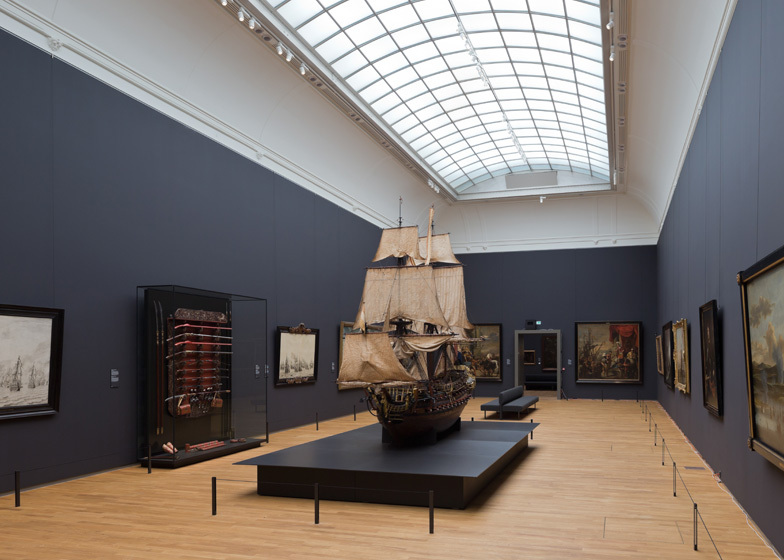 The presentation of the Rijksmuseum's world-famous collection is also new. For the very first time, visitors can follow a chronological journey through the collection, and experience the sense of beauty and time this offers. In a sequence of 80 galleries, 8,000 objects tell the story of 800 years of Dutch art and history. Only Rembrandt's masterpiece The Night Watch will be returning to its original position. The renovation and opening of the Rijksmuseum is made possible by founder Philips and main sponsors BankGiro Lottery, ING and KPN. The restoration of the Cuypers colours is made possible by AKZONobel/Sikkens. 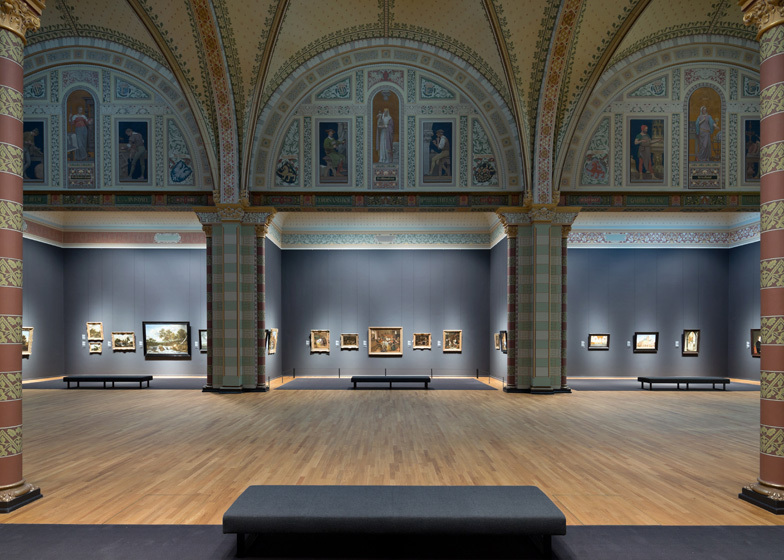 The new presentation of the Rijksmuseum collection is a journey through Dutch art and history from the Middle Ages and Renaissance until the 20th century. The story of the Netherlands has been set in an international context and is told chronologically across four separate floors. Paintings, prints, drawings, photographs, silver, porcelain, delftware, furniture, jewellery, arms, fashion and objects from Dutch history will be presented together for the very first time. More than 30 galleries are dedicated to the glory of the Golden Age, when the young mercantile republic led the world in trade, science, military exploits and the arts. At the heart of the museum will be the magnificently restored Gallery of Honour, presenting world-famous masterpieces by Vermeer, Rembrandt, Frans Hals and Jan Steen. 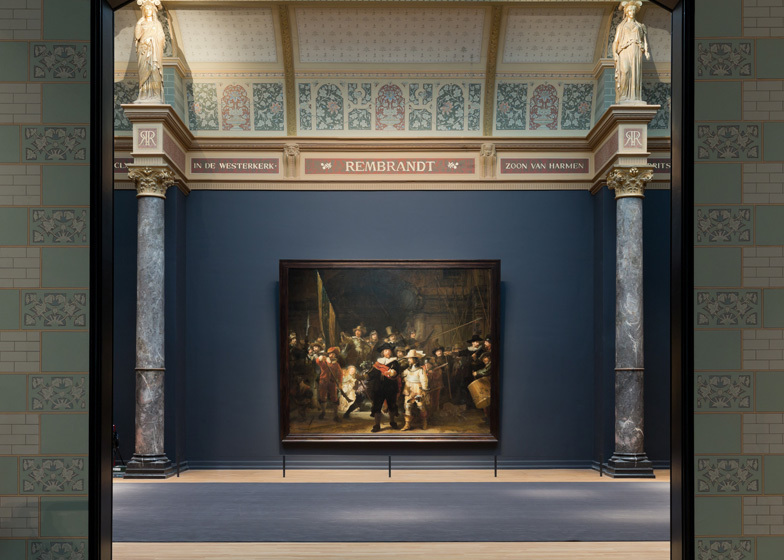 The Gallery of Honour leads visitors to the dedicated space that architect Cuypers created for Rembrandt’s The Night Watch in the late 19th century, and where this huge masterpiece can once again be admired. New to the presentation are the 20th century galleries. Paintings, furniture, photography, film and an aeroplane paint a picture of Dutch culture from the last century. The Special Collections are also displayed separately for the first time. Here, visitors will be able to discover famous and unexpected objects from the applied arts, science and national history, such as ship and navy models, musical instruments, and an armoury. The 'Golden Bend' in the Herengracht (1671-72) by Gerrit Berckheyde, one of the highlights of the Dutch landscape genre from the Golden Age. Acquired with the support of Royal Dutch Shell, the National Art Collections Fund foundation and the BankGiro Lottery. The Burgomaster of Delft and his Daughter (1655) by Jan Steen, one of the masterpieces of the 17th century collection. Acquired with the support of the BankGiro Lottery, The Mondrian Fund, VSB, Vereniging Rembrandt and National Art Collections Fund foundation. A rare white armchair (1923) by Dutch designer and architect Gerrit Rietveld. With the support of the BankGiro Lottery Fund. Two-metre high wooden sculptures of celestial warriors from Japan, temple guardians from the 14th century. With the support of the BankGiro Lottery Fund, the M.J. Drabbe Fund, The Mondrian Foundation and Vereniging Rembrandt. 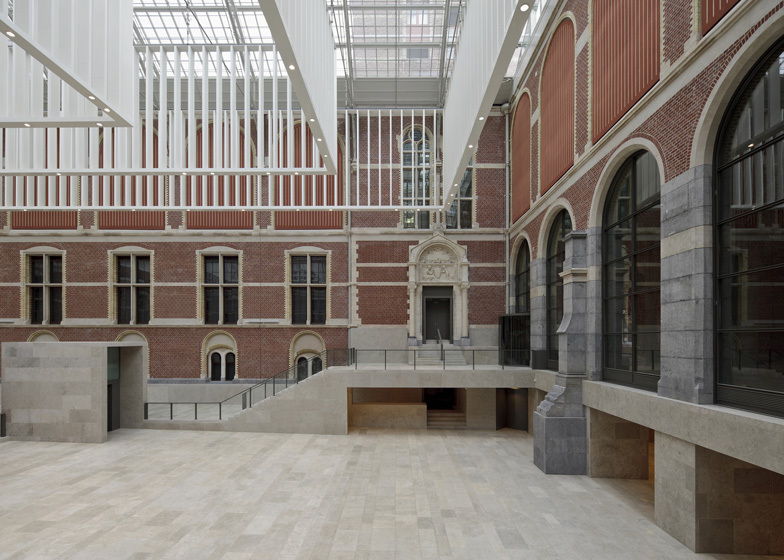 The main building of the Rijksmuseum has undergone a spectacular transformation. The lead architect for the renovation was Seville-based architecture firm Cruz y Ortiz. They based their ideas on the original design by Pierre Cuypers, the 19th-century architect of the museum. 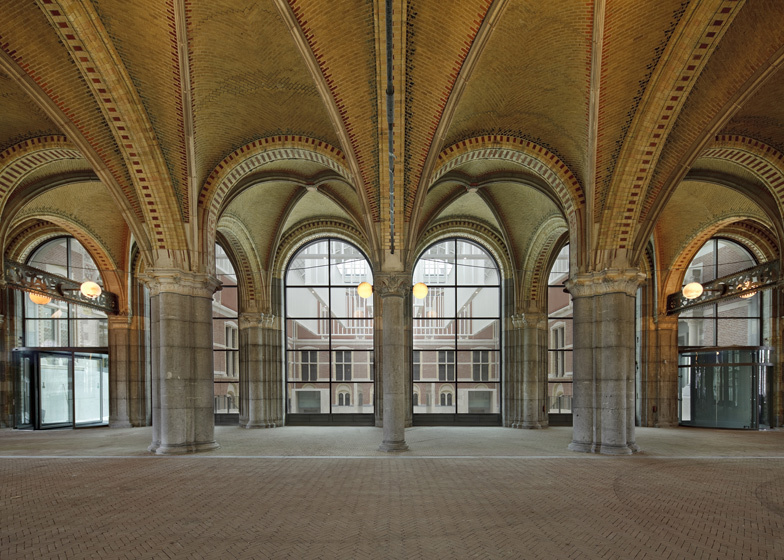 Under the motto Cuypers for the 21st century, and in close collaboration with Dutch restoration architect Van Hoogevest, the architects have turned the 19th-century national monument into a modern museum for the 21st century, restoring and introducing light and space. Cruz y Ortiz have opened up the previously converted inner courtyards into an impressive glass-covered new entrance hall, known as the Atrium. The original, richly decorated walls and ceilings have been revealed again in a number of places under the guidance of architect Van Hoogevest. The French architect Jean-Michel Wilmotte, known for his work in the Louvre, is responsible for the design of the Rijksmuseum galleries. He has designed elegant display cases, plinths, lighting and furniture, and has selected an interior colour scheme inspired by Pierre Cuypers' palette for the building. Surrounded by water, the new Asian Pavilion is made from Portuguese stone and glass, and is characterised by many oblique surfaces and unusual sightlines. It houses the museum's rich collection of Asian art from China, Japan, Indonesia, India, Vietnam and Thailand, dating from 2000 B.C. to 2000 A.D. A total of approximately 350 objects will be on display. Based on Cuypers' 1901 design, the Rijksmuseum gardens' new layout was created by Dutch garden and landscape architecture firm Copijn. The gardens feature several of the original formal garden styles, as well as classical statues, and fragments and ornaments of historic buildings. A fountain, a water artwork designed by Jeppe Hein, a 19th-century greenhouse with 'forgotten' vegetables, and a children's garden with playground equipment by Dutch designer Aldo van Eyck will soon be added to this "outdoor museum". A Henry Moore exhibition will open in the new gardens on 21 June 2013, the first in a series of international sculpture exhibitions to be held each year.